Thomas Jefferson (1743-1826) - The third president of the United States and author of the Declaration of Independence, Thomas Jefferson was a central figure in the founding of the United States (perhaps second only to George Washington). He tripled the size of the country with one transaction, the Louisiana Purchase, then commissioned the famous Louis and Clark expedition to explore that territory. His political career began in 1769 when he was elected to the Virginia House of Burgessess; an office he held until 1775. That year he was sent to Philadelphia as a delegate of the Second Continental Congress to replace Peyton Randolph who returned to Virginia in order to preside over the House of Burgessess. Jefferson quickly became a standout member of the Continental Congress thanks in part to the friendship he formed with John Adams. Despite their political differences, the two remained friends for the rest of their lives (although they had a falling out when they competed for the presidency, they eventually renewed their friendship). Adams, one of the most influential members of the Continental Congress, saw to it that Jefferson was on the five-man committee chosen to write the Declaration of Independence. In fact, he persuaded Jefferson to write the document. Jefferson (and most of the other committee members) had wanted Adams to write it, but Adams recognized Jefferson's talent as a writer, and Jefferson relented. In addition to being one of the most significant documents in history, it is also considered a literary masterpiece (of course it was revised considerably by the other members). 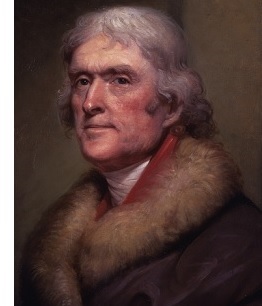 Jefferson's role in the infant federal government continued after America won its independence. He represented Virginia as a member of the Confederation Congress (as it was known before the US Constitution). After only two years, he was appointed America's Minister to France (essentially an ambassador). As a result of being overseas at the time, he played no role in the drafting of the Constitution. But upon its adoption, George Washington was elected the country's first president and he asked Thomas Jefferson to be his first secretary of state. Jefferson accepted. However, there was a lot of friction in Washington's cabinet between Jefferson and secretary of treasury, Alexander Hamilton. This led to Jefferson's resignation after Washington's first term. He came back four years later and ran for president, where he finished second to John Adams. In those days, the candidate who finished second in voting became vice-president (a policy which didn't work out so well and was abandoned around the time of the Civil War). He tried again against Adams in the 1800 election and this time he won. Like Washington, he served two terms, and also like Washington refused to run for a third term. The most lasting legacy of Jefferson's presidency was the aforementioned Louisiana Purchase. But lesser known is the fact that the United States engaged in its first foreign war under Jefferson, known the the First Barbary War. After he retired from politics he founded the University of Virginia which remains a major learning institution to this day (Jefferson himself attended William & Mary). In a bit of interesting trivia, both he and Adams died on the very same day, 50 years to the day after the signing of the Declaration of Independence.